This week Alsop High School in Liverpool received five special visitors as part of the FAITH 2017 initiative. Five #PilgrimEd Teddies will be spending the next forty days at Alsop and partner primary schools. On Monday 27th February 2017 ten Alsop students had the pleasure of visiting the Eden Valley near Penrith, Cumbria. 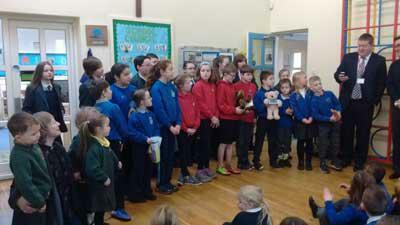 Students visited Temple Sowerby CE Primary School, a delightful village school with 55 students. During the visit Mr Peter Bull, Co-ordinator of FAITH 2017 led the school assembly and spoke about #PilgrimEd and the 40 Acts of Kindness Initiative. 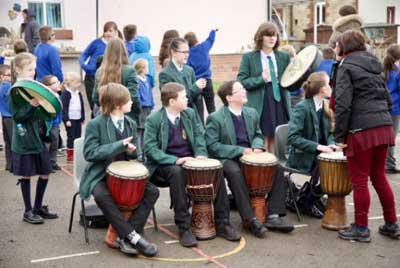 As part of the assembly Alsop students led the school children into the yard. Here Alsop Young Leaders played drums as 40 balloons were released to start 40 Acts of Kindness. Communities sending teddies on the pilgrimage are Asby Endowed, Milburn, Long Marton, Temple Sowerby and Warcop. Four children from Asby went to Temple Sowerby with Janice. The bears are going to visit Churches, synagogues and other places of interest in Liverpool and report back via a blog. The school from Liverpool brought 40 balloons to Temple Sowerby which were let off in the playground to represent the 40 days of Lent. The children were encouraged to do a random act of kindness at least once a day throughout Lent and to keep up to date with the bear’s blog online. Mr Bull commented: "It was lovely to take our students away from their urban setting and watch them interact and engage school children in a rural environment." 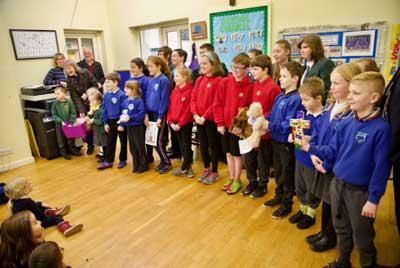 The young people returned to the tiny school hall where the school children handed over their treasured school teddies to begin. They will visit places of worship including churches, a mosque and a synagogue. They will interview people. One will be spending a week with Merseyside Police. One will spend some time at King David Primary School. 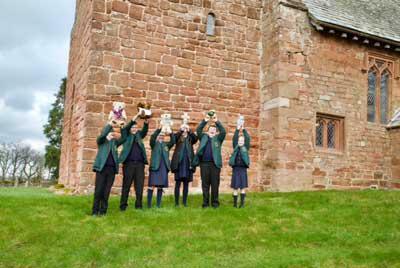 During the visit to Cumbria the students also visited a church which dates back to Saxon times. The visit concluded with a visit to Abbotts Lodge Dairy Farm. Here the young people sampled delicious home-made ice cream made fresh from the farm.